The alpine mountaineering trips which we are offering have been chosen among the most beautiful and most famous ones in the respective areas in the Dolomites. Partially the trails are crossing glaciers or sometimes "airy" paths which are equipped with via ferratas. The guidance by a mountain guide is indispensable, unless you have great high mountain experience and complete command of rope maneuvers which are necessary for the crossing of glaciers (for example rescue maneuvers from glacier crevasses, knot system for a rope team) as well as the correct use of the technical equipment on the via ferrata. The safety of the participants is top priority for the mountain guide of Alpine School Arco. He will teach the participants alpine techniques and demonstrate how to handle possible perils in the mountains in a proper way. It is possible to change the date of the alpine guided trips, once the minimum number of participants has been reached or once the amount corresponding to the minimum. number of participants has been paid. For our guests who are arriving by plane we are offering a pick-up service from the airport to Lake Garda. Garda Lake Trentino - High and steep mountains emerging from the quiet blue sea water, green valleys rich of torrents, waterfalls, small lakes, meadows and forests. 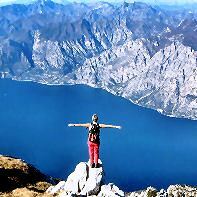 Here at Lake Garda every outdoor activity is possible all year round. The village of Arco is a famous spot for rock climbing, here are the most difficult and panoramic via ferratas. The Lake Garda area is suitable for every type and length of on the paths from hut to hut built by Italian soldiers in the WW1. In winter time the mountains tops around Lake Garda are covered by snow and it is not rare that our Alpine School accompanies its customers skiing in the morning and rock climbing in a T-Shirt in the afternoon in the lower sunny spots. Description: guided trip with alpine character in a particular scenic landscape with excellent view over entire Lake Garda; departing from Rovereto with our mini-van, we are heading towards Malcesine. By cable car will arrive at an altitude of appx. 1.750 m. Our trip from hut to hut will follow the crest of Mount Baldo - ascent to "Valdritta Peak" (2.218 m - optional and alpine). After ca. 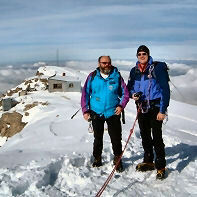 4 to 5 hrs we will reach the mountain lodge "Rifugio Telegrafo" where we will stay overnight. Ascent to Mount Telegrafo on the next days our route following descent to Malcesine through lonely and wild valleys. Duration ca. 4 Std. Back to Rovereto and/or your accommodation. What to bring: backpack - water - sandwich - light windcheater - solid boots - sticks - silk or cotton liner. Pasubio Dolomites presents the same rock as the Brenta Group which explains its second name The little Dolomites They are situated between Trentino and Veneto. On a clear day you can normally see the white beaches of Venice from some of the tops of the Pasubio Dolomites. In this area used to run the border between Austria and Italy and this is also where the soldiers fought between 1916 to 1918. We can visit many remainders of forts, trenches and tunnels of WW1. The environment offers meadow and forests with easy paths. The most difficult routes follows the traces and trenches of WW1 on the ridges and ledges up to the rock walls. 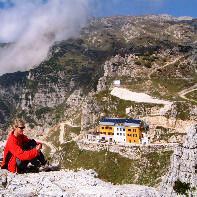 The Pasubio Group is ca. 1 hr. by car from Lake Garda and is accessible from May to October. 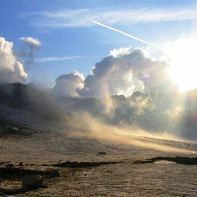 Description: guided trip from hut to hut with a very particular historical background in a very scenic landscape. 1st day - We are departing from Rovereto with our mini-van, after ca. 30 min we will reach a characteristic mountain village. This is the starting point of our excursion. After about 3 hrs. through meadows and passing alps, we will reach Peak Col Santo at 2.112 m. which has been of great importance during World War I - ca. 3 hrs. 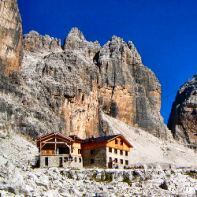 - descent to the mountain lodge "Rifugio Vicenzo Lancia" in ca. 40 min. Overnight stay. Back to Rovereto and/or your accommodation. What to bring: backpack - water - sandwich - light windcheater - solid boots - sleeping sheet. Note: for the overnight stays incl. half-board (breakfast+dinner) in the lodge, one should calculate extra costs of appx. EUR 40,00 per day. Brenta Dolomites - It is amazing to think that these high peaks and walls only 300 million years ago have been the bottom of the Sea. The subsequent deposit layers of animal bones, sand and shells have created these multicolored rocks within millions of years. The Brenta Dolomites are not only big walls but also green forests, valleys and meadows where cows are grazing, torrents and high waterfalls. This is a wild environment where bears and the local population can coexist safely. The presence of many mountain lodges and huts in the Brenta mountains makes the area very popular for hiking from lodge to lodge or from hut to hut on the trips of the famous guided via ferratas Bocchette del Brenta. Description: Extremely scenic trip in the astounding surroundings of towers and eternal walls of the Dolomites which can be admired from the vicinity. 1st day - Departing from Rovereto with our minivan, we are heading towards Madonna di Campiglio until we have reached the starting point of our trip after ca. 90 min. by car. After ca. 2 hrs. on a footpath through a pine forest, we will reach the mountain lodge "Rifugio Brentei" at an altitude of 2.180 m. Overnight stay. 2nd day - Ascent to "Bocca di Brenta" - on "Via ferrata Bocchette Centrali" to the mountain lodge "Rifugio Alimonta" (2.580 m) - ca. 6 hrs. climbing time. Overnight stay. 3rd day - Ascent to "Vedretta degli Sfulmini" - on "Via ferrata Bocchette alte del Brenta" to "Bocca di Tuckett" - descent to the mountain lodge "Rifugio Tuckett" and back to the valley an our mini-van. Duration: ca. 8 hrs. Back to Rovereto and/or your accommodation. VARIANT - instead of going back to the valley, it is possible to stay overnight in the alpine lodge "Tuckett" and to descend to the valley on the following day. Note: for the overnight stays incl. half-board (breakfast+dinner) in the lodge, one should calculate extra costs of appx. EUR 50,00 per day. Description: Extremely scenic guided trip in the astounding surroundings of towers and eternal walls which can be admired from the vicinity. Ascent of the highest top of this mountain chain. 1st day - Departing from Rovereto with our mini-van, we are heading towards Madonna di Campiglio until we have reached the starting point of our trip after ca. 90 min. by car. The ascent to the mountain lodge "Pedrotti alla Tosa" (2.490 m) takes about 4 hours. Overnight stay. 2nd day - Ascent of Tosa peak - further on "Via ferrata Bocchette del Brenta" and passing Bocca d'Ambiez - descent to the mountain lodge "Rifugio XII Apostoli" (2.490 m) - ca. 7 hours - overnight stay. 3rd day - Ascent to Bocchetta dei Camosci - descent to Bentei lodge via Vedretta dei Camosci (crampons). Back to the starting point of our trip. Approximate: 6 hrs. What to bring: backpack - water - sandwich - windcheater - solid boots - poles - sleeping sheet. Equipment for via ferrata: harness, ferrata-set, helmet, crampons (can be rented from the mountain guide upon request). Marmolada Group is located in the eastern part of the Trentino and offers the highest top of the Dolomites: Punta Penia. The mountain chain extends from North to South and presents two sides both of which are very interesting. Towards the South it breaks into breathtaking cliffs with the largest climbing walls in the world where hundreds of alpinists have climbed numerous routes of extreme difficulty. The north face presents a large and steep glacier where it is possible to exercise any type of alpine mountaineering activity. The ridge itself is composed of several summits decreasing in altitude from the Western to the Eastern part. Before World War 1 there ran the border between Austria and Italy. The Austrian soldiers were hiding in deep tunnels in the glaciers North face whereas the Italian soldiers were quartered on the steep South face of the Marmolada. During the retreat of the Marmolada glacier sometimes war remainders can be still found. The Marmolada is very suitable for our alpine mountaineering courses because the glacier is easily accessible from the alpine mountain lodge in approximately 20 minutes. The mountain guides of our rock climbing school often visit the Marmolada to climb the difficult via ferrata which is running on the East Ridge. Meeting point: Ora/Auer train station - at 10.00 a.m. or in your Hotel. Description: High-alpine guided trip with wonderful panorama - didactics: use of pick and crampons on ice and glacier. 1st day - Departing from our meeting point with our mini-van, we are heading towards Fassa Valley. After ca. 90 min. by car, we have reached Lake Fedaia from where we will take the cableway to the mountain lodge "Rifugio Pian dei Fiacconi" (2.625 m). On the adjacent glacier we will teach and practice the correct use of pick and crampons in ascent and descent. Overnight stay in "Pian dei Fiacconi" lodge. 2nd day - Ascent to Forcella Marmolada (2.896 m); descent to Contrin lodge (2.016 m), duration: ca. 5 hrs. 3rd day - Ascent to Passo Ombretta at 2.730 m, excellent view of the famous South Wall of Marmolada - descent to the mountain lodge "Rifugio Falier" and Malga Ciapela, ca. 5 hrs. - End of the trip. Back to Rovereto and/or your accommodation. What to bring: backpack - water - sandwich - windcheater - preferably boots which are suitable for the use with crampons - gloves - hat/cap - sunglasses - sticks - sleeping sheet. Equipment: harness, crampons (can be rented from the mountain guide upon request). Note: for the overnight stays incl. half-board (breakfast+dinner) in the lodge, one should calculate extra costs of appx. EUR 50,00 per day + ca. EUR 10,00 for the cableway. Adamello glacier - The Adamello National Park is the largest glacier in Trentino and larger than the one of Mont Blanc. Unlike the Brenta mountains which are of sedimentary origin, the mountains in the Adamello Group have a volcanic background. The glaciers extend over large areas and the rock is composed of smooth, magnificent white granite plaques. The Italian and Austrian soldiers fought for three long winters on these rugged mountains. Sometimes the eternal ice releases soldiers bodies and their weapons. During our routes from lodge to lodge we almost always find unexploded bombs and many remnants of the WWI. It is a prerequisite have a good physical condition as well as mountaineering experience, if you want to conquer these wild mountains. The duration of our routes from hut to hut or from lodge to lodge depends on weather conditions: fog, snow and crevasses may slow the march but the worst thing is the lack of preparation of the participants in our trips. Description: Guided high-alpine trip against a famous historical background. The crossing of Care' Alto - Lares - Lobbie - Mandron glaciers is the dream of each mountaineer; it does involve technical difficulties; sometimes on the crossing of Cavento Pass it will be necessary to do some rock climbing and we have to rappel you down - however the most important prerequisite for the participation at this guided trip is an excellent physical condition and good fitness. 1st day - departure from our meeting point at Lake Garda - we are heading towards Madonna di Campiglio. After approx. 90 min. by car we have reached Borzago Valley which is the starting point of our trip. After an ascent of ca. 3 - 4 hrs. through the Adamello Brenta National Park rich of waterfalls, we will arrive at the mountain lodge Rifugio Care' Alto at 2.460 m. where we will spend the night. 2nd day - On the following day ascent to Care' Alto Glacier and Vedretta di Lares; further on to the historically very important Corno di Cavento Pass (3.190 m.). The "White War" has left behind many remainders even at this elevated altitude. Crossing of Lobbia glacier until we have reached the "Rifugio ai caduti dell' Adamello" at 3.040 m. where we are spending the second night. Depending on the weather and glacier conditions, this crossing trip can take from 9 to 10 hours. 3rd day - Descent and crossing of Mandron glacier to Lodge "Rifugio Citta di Trento al Mandron" (there it is possible to have lunch), further descent to the valley until we have reached Bedole Lodge and the parking lot: ca. 6 hrs. What to bring: large backpack which fits the following: Water (at least one/2 ltr. per day/per person) - food - windcheater, mountaineering trousers (no jeans), heavy boots (suitable for crampons) - poles - gloves - hat/cap - sunglasses - sun protection cream - liner. Technical equipment: ice-axe, crampons, harness will be provided by your Mountain Guide (included in the price). Note: for the overnight stay incl. half-board you should calculate ca. EUR 50,00 per day (not incl. in our price). Our highlights regarding guided via ferrata at Lake Garda or in the Alps or on the Greek Island Kalymnos have not been chosen by our alpine mountain guides school but are the preferences of our customers in the 20 years of our activity. Please click on the image for a complete program of our trips and courses.